Dennis Diamond with the green sea turtle he found in Bond Bay near Ketchikan. Dennis Diamond did a double take when he saw the big green sea turtle on the beach near Ketchikan. Diamond found the 171-pound, three-foot-long turtle about 10 miles northwest of Ketchikan. Considered a tropical and subtropical turtle, the green sea turtle is one of four sea turtle species that occasionally strays into Alaska waters. An avid beach comber and outdoorsman, Diamond was fishing for winter kings off the Cleveland Peninsula on Dec. 3, 2010, when he decided to go ashore in Bond Bay. He cut a few rounds off some cedar logs for his woodstove and hauled them down the beach to his skiff when an excited Steller jay caught his eye. Diamond said the turtle was dead but completely intact. He didn’t want the next tide to take the turtle, so he pulled it about three feet up the beach, above the high tide line. “It was all I could do to move it, it was pretty heavy,” he said. As he headed back to town, Diamond checked the water temperature. “It was 41 or 42 degrees; I figured that’s what killed it,” he said. When he got back to Ketchikan, he called Fish and Game and spoke with fishery biologist Bo Meredith. Meredith said Fish and Game was interested in the turtle, and the next morning Diamond retrieved the animal from the beach. “I came back at dawn and there were a couple eagles sitting there,” he said. The eyes had been pecked out, and the scavengers had begun pecking into the body cavity, but it was still in very good condition. Diamond brought the turtle into the Ketchikan Fish and Game office and biologists Boyd Porter, Scott Walker and Meredith examined the carcass. They made arrangements for ADF&G veterinarian Kimberlee Beckmen to conduct a necropsy, and prepared to ship the turtle to her in Fairbanks. A snapshot of the turtle as Diamond found it on the beach. The cause of death was bronchial obstruction and lung collapse, and there were two types of plastic bags and a wad of monofilament fishing line in the stomach. The digestive tract had become infected and inflamed. “Not to mention it was probably freezing to death,” Meredith added. Remarkable as it might seem, it’s not the first green sea turtle seen near Ketchikan. 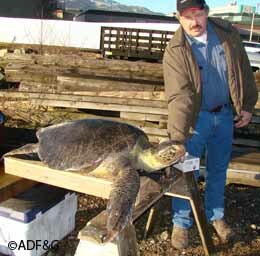 In Nov. 1999 another dead green sea turtle was found just south of Ketchikan. Another was found dead on a beach in Eliza Bay on the southern end of Admiralty Island. Diamond’s find actually marks the 20th sighting of a green sea turtle in Alaska since 1960, and that includes sightings of five live turtles. A live green sea turtle was found on the Copper River Flats near Cordova in 1996 and transported to Sea World in San Diego, California. Meredith said that animal was rehabilitated, tagged and later released. “It was last seen off the Oregon coast swimming north,” he said. All told, Alaska sea turtle sightings include four olive ridleys, two loggerheads, 19 leatherbacks, and three live, unidentified sea turtles. Bruce Wing offered some insights on how these tropical and subtropical marine reptiles end up in Alaska waters. Wing is an oceanographer, zoologist and fishery research biologist who has worked for NOAA’s Auke Bay laboratory in Juneau since 1962. He’s kept the records on sea turtles in Alaska waters for almost 50 years. At 171-pounds and about 3-feet in length, this adult female is average for a green sea turtle. Green sea turtles are one of four species of marine turtles that sometimes stray into Alaska waters. Wing said in all animal populations some individuals stray beyond their normal ranges. He suspects the green sea turtles and the ridleys that have been discovered in Alaska are likely from Mexican populations. “This is supported by the observation that several of the green turtles have been identified as ‘black turtles.’ This is a race of greens found along the west coast of central Mexico,” he wrote. He believes that most of the turtles in Alaska waters arrive in the late summer and fall, being caught in the eastern portion of the Gulf of Alaska gyre. This is current runs north up the coast of British Columbia and Southeast Alaska. Wing said the green sea turtle captured in 1996 near Cordova, rehabilitated and then released in San Diego, provided some clues. After release it was tracked north and west to Oregon coastal waters. It’s possible that a turtle swimming north on that route would then encounter the transition zone between currents moving south and those moving north up the coast, eventually becoming entrained in the northerly flowing currents and be transported to the Alaska coast. The green sea turtle Diamond found is likely on a return trip to Ketchikan. Biologists there are working with Dr. Beckmen to secure the permits needed to keep and display the turtle shell and skull. “I'm happy it’s going to the Ketchikan office,” Diamond said. Riley Woodford is a writer and producer with the Division of Wildlife Conservation, and edits Alaska Fish and Wildlife News. While he has never seen a sea turtle, he had two pet turtles growing up and worked with desert tortoises in the Mojave for two seasons.